About two months ago, browsing through my book shelf on the IPAD, I came across this wonderful cover – a big huge cardboard box being lifted by a person. This caught my interest and after realizing that this is the Zappos story, it just got me hooked. My passion of e-commerce and my preferred book categories – autobiographies, immediately took me to start reading the book. Tony Hsieh, candidly starts off from his childhood where, in his words, he admits that he was not what you would call a model student. He preferred reading a magazine rather than learning to play a musical instrument that his parents had him enrolled for. Right from a young age, the entrepreneurship bug had bitten him, and he details the earthworm venture that had failed before it had even started. His advertisement for a magic kit, generated only one order, but that did not loosened his spirit by a bit. In Harvard, he had figured out how to make money selling food on campus. His brief stint at oracle after campus is something that most of us would relate to. A normal job, being restless, finding it tedious and being drawn towards entrepreneurship – these are the things that I keep hearing from most people my age. LinkExchange, his first major business, which was a mix and match of a clever idea eventually got sold to Microsoft for 265 million dollars. This sale came with the caveat that he had to be a part of the company for a year. For a brief period of time, after the sale of Linkexchange to Microsoft, Tony dabbled with poker, investing and other things when Tony realized his real passion lies in building companies. In spite of the risk of losing the money, and trading a chill life, he again got back into business costing him 8 million dollars! This book is less about the e-commerce business company, and more about the great culture that he managed to imbibe into the organization. Today, without a doubt, everybody would agree that zappos is more known for its winning culture rather than the business of selling shoes. From day to day decisions that would be on the mind of any startup entrepreneur – whether to hold inventory or outsource it? To bigger life decisions like – sell off everything that he owned to put into the business, the book details it all out. From the beginning days of zappos itself, Tony was clear that the USP of the company had to be its “World’s best customer service”. The call centre reps had just one KRA : WOW the customers. And they did, in turn getting more orders and generating wide reaching word of mouth. Within a decade, Zappos hit a billion dollar in sales, and was the numero uno in online shoe selling. Eventually Amazon bought over the company for 1.2 bilion dollars and this particular chapter is detailed out with clear alacrity from the author. Reading this one, you actually feel a part of this whole happening and by then you start relating to the company as if you have been a part of it for a long time. The whole book is cleverly structured into three parts – Tony’s childhood till he starts looking after Zappos, The Zappos Story and finally Tony’s lessons in public speaking and public relations and the core that is within Zappos. The most important take out from the book is the chapter on the core values that make up the soul of zappos. 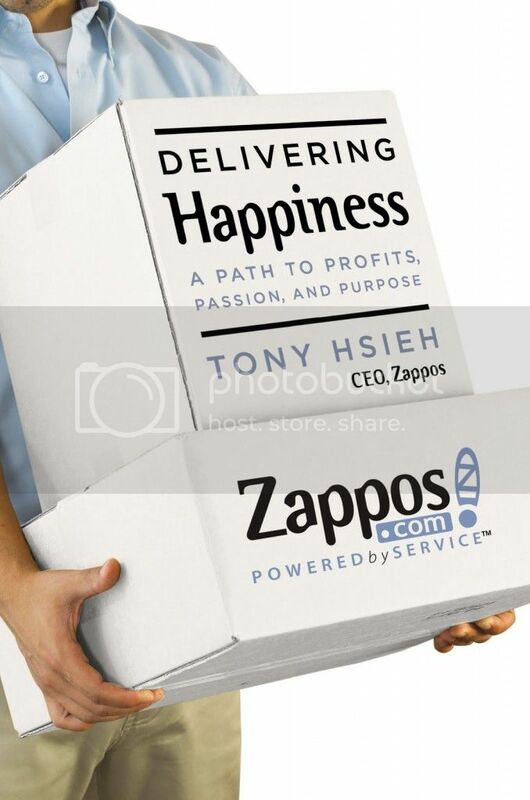 Delivering happiness, as Tony Hsieh points out, is the single corporate mission for the company.